KEEP CALM AND CARRY ON: Easter Basket Ideas For Toddlers! Easter Basket Ideas For Toddlers! 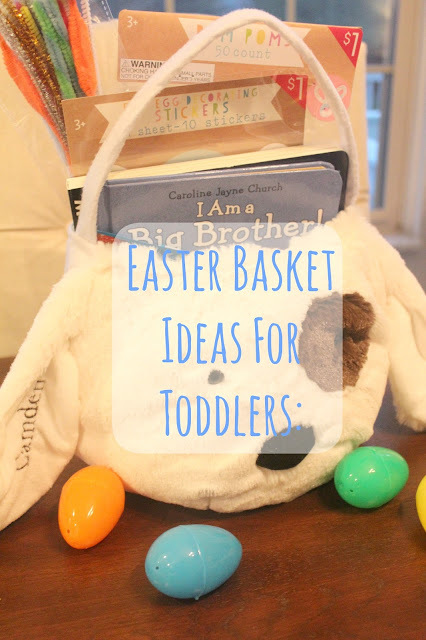 Now for today's post...Easter basket ideas for those cute little toddlers! I thought I would share what I'm putting in Cam's basket this year because he's at the age where he doesn't eat candy, so filling up those plastic eggs and baskets you've got to be a little more creative. Also, I'm on a bunch of Mom Facebook groups and I've seen many people ask for ideas for their kids baskets! I thought some of you might be interested to see the ideas I got! In the years to come even when Cam gets bigger, I like the idea of doing less candy and more practical items. First things first-his basket is from Pottery Barn Kids and is a great size! It holds a lot and of course, it's really adorable and has his name personalized on one of the ears. PS: Their baskets are on sale + free shipping right now! -Crafts from Target's $1 spot (because hello-it's amazing.) They have the cutest selection of things right now-I picked up a felt egg to decorate with stickers, pom poms, and pipe cleaners. Both the pom poms and pipe cleaners are perfect for crafts and entertaining purposes! I like to use an empty parmesan cheese container and have Cam practice sticking the pipe cleaners in the holes. -Not pictured, but we also got him a pair of Crocs (these ones) and a new rashguard/swim trunks. I think I'm going to do a new swimsuit in his basket every year - it's perfect with summer approaching! -As far as snacks go, I plan to put yogurt raisins, goldfish, and some fruit snacks in his plastic eggs when the day comes! I admit I had a little too much fun putting it all together, and can't wait to give it to him! Number 592 that I say this...being a mom is AWESOME. Tell me - what are you putting in your kids Easter basket? What great ideas did you come up with? So cute! I love making Easter baskets, and there's so many fun things out there these days that are inexpensive. Love it! I got my niece a bathing suit, a top, a Big Sister book, and will get her fave snacks to put in a cute little Easter jute bag. Harper is so obsessed with bubbles right now, so homegirl got a bunch of different varieties! Long wands, short ones..you name it & the girl will get them in her Easter basket! Perfect also since the weather is getting nicer out! I love this! It's so sweet to get him the big brother book. That will be so much fun to read with him! I'm excited to do a little basket for Olivia, even though she has no idea what Easter is. Ha! I'm just doing books and a couple of little bath squirters we can use for tummy time now and bath later.